– weighing 4 tons, with a total of 36 cylinders, powered by 3 Liberty V12 aircraft engines with a total capacity of 81.18 litres, developing 1500 bhp (at 2,000 rpm) crashed during an attempt at the world land speed record, killing its driver Lee Bible, at Ormond Beach, Florida. His first run was clocked at less than 186 mph– well short of the record. In the return run he reached 202 mph, but just past the time trap the car suddenly swerved. Most believe it was caused by Bible releasing the gas pedal too quickly–the rapid deceleration causing the loss of control. The machine crashed into the dunes about one hundred feet past the timing trap and rolled– coming to a rest two-hundred feet down the sandy track. Bible’s body was thrown from the car. The out of control Triplex had also run into an unfortunate cameraman Charles Traub, who had panicked and while attempting to avoid the out-of-control car ran directly into its path. Had he stayed at his camera’s set-up location, he would not have been harmed. Both men were killed instantly. The White Triplex was completely and utterly destroyed in the crash. Interestingly Ray Keech had established a new world land speed record of 207.55 mph in this monster at Daytona the previous year. It is said that he took a high fee, survived scalding water from a burst hose, exhaust fumes and a fire in the front engine, but he was successful, and said that no money would induce him to drive the car ever again……. 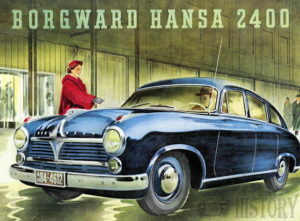 70 years ago this week, exhibited as a world premiere at the 1949 Geneva Motor Show, the German Borgward Hansa reappeared in 1950 in the form of a 4-door saloon [17 March 1 949]. The 4-cylinder engine was coupled to an automatic gearbox manufactured in-house that, according to the model’s advertising, ” allowed customers to drive without using the clutch or changing gear”………..60 years ago this week, Fiat introduced two new six-cylinder models, the 1800 and 2100, at the Geneva Motor Show [12 March 1959]. Powered by either a 1795cc with 75bhp or a 2054cc with 82bhp, they were the pinnacle of the Fiat range. These cars were the first Fiats to use torsion bar suspension at the front and the first since the war to use a straight-six engine……..Phil Hill was on the cover of Sports Illustrated magazine, which named him “Sportscar Driver of the Year” [16 March 1959]……..The first car to carry the Porsche family name was introduced [17 March 1959]. After serving a two-year prison sentence for his participation as an engineer in Hitler’s regime, Ferdinand Porsche and his son Ferry went to work on a car that would carry the Porsche name. The Porsche prototype, named the 356, was a sports-car version of the Volkswagen that Porsche had designed at Hitler’s request. Its rounded lines, rear engine, and open two-seater design set the standard for all Porsches to come. The classic design and the incomparable engineering of Porsche cars attracted loyal customers at a record pace. In 1950, Ferdinand Porsche celebrated his 75th birthday. 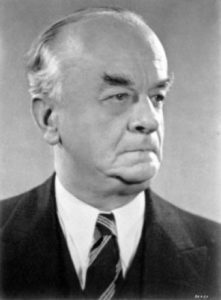 He had risen to fame as an engineer for Mercedes; he had developed the Volkswagen; and he had finally put his name to his own automobile. One year later, Porsche suffered a stroke from which he would never recover. He died in January of 1952. 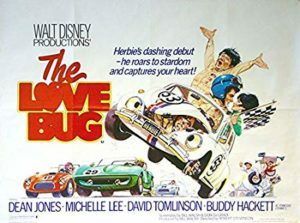 Ferry Porsche, Ferdinand’s son, built the Porsche Company into the empire it is today……….50 years ago this week, the Walt Disney studio released The Love Bug [13 March 1969]. Directed by Robert Stevenson, the film starred “Herbie,” a lovable Volkswagen bug with a personality. Abused by the evil race-car driver “Thorndyke” (David Thomlinson), Herbie is rescued by the young good-guy race-car driver “Jim” (Dean Jones). Grateful for his rescue, Herbie rewards the hapless Jim by winning one race after another on his driver’s behalf. The excitement begins when the ruthless Thorndyke plots to get Herbie back by any means necessary. Based on a story by Gordon Buford, The Love Bug inspired several sequels, including Herbie Rides Again, Herbie Goes To Monte Carlo, Herbie Goes Bananas, and Herbie: Fully Loaded. By becoming one of the biggest grossing films of 1969, The Love Bug allayed any fears that the Disney Studio would collapse without the presence of the recently deceased Walt Disney. The movie became a children’s film classic and enhanced the Volkswagen Beetle’s image as a quirky car endowed with more than solid engineering……..Jackie Stewart driving a Matra-Cosworth MS80 won the Race of Champions at Brand Hatch, England [16 March 1969]………..40 years ago this week, Cale Yarborough roared to his 60th NASCAR Grand National victory, cruising to a six-second win at Richmond (Virginia, US) Fairgrounds Raceway’s .542-mile track [11 March 1979]. Bobby Allison finished second as the only other car on the lead lap with Darrell Waltrip third — completing a top three of drivers now enshrined in the NASCAR Hall of Fame. Only two cautions slowed the race, which set a track record for average speed at 83.608 mph………..on the same day [11 March 1979], Gordon Johncock won the first ever CART sanctioned Indy Car race, the ‘Jimmy Bryan 150’ at Phoenix International Raceway. Bobby Unser led until Danny Ongais took over on lap 87. Ongais had a 20 second lead and had lapped all but four cars before a long pit stop under green on lap 119 dropped him to 5th. Johncock took over as Ongais closed quickly before blowing the motor in the Interscope Special 10 laps later. Rick Mears finished second and Johnny Rutherford third. Johncock was driving the Patrick Racing Penske PC6…the first time that a Penske fielded by another team had beaten Penske’s own entries……….20 years ago this week, the Renault Avantime, one-box design without B-pillars — styled by Patrick Le Quément was unveiled at the Geneva Auto Show [11 March 1999]. 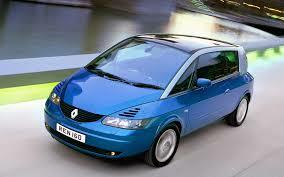 The Avantime was designed to combine the space and design of an MPV with the style of a 2+2 Coupé. Renault sold just 8,545 in two years before pulling the plug. The Zonda C12 made also made its debut in Geneva. Powered by a 6.0 L Mercedes-Benz V12 engine producing 389 hp, mated to a 5-speed manual transmission gearbox. The C12 could accelerate to 60 mph (97 km/h) in 4.2 seconds and to 100 mph (160 km/h) in 9.2 seconds……..DaimlerChrysler unveiled the first driveable zero-emission, fuel cell car in the US, that demonstrated a 40% increase in fuel cell power and up to three times the range of a battery-powered vehicle [17 March 1999]. NECAR 4 (New Electric Car -cover image), used fuel cell technology to generate electricity and water vapour. Based on a Mercedes-Benz A-class compact car, NECAR 4 could achieve 90 mph and travel nearly 280 miles (450 km) before refuelling. The fuel cell system was incorporated in the vehicle floor allowing the compact car to comfortably seat five passengers and leave plenty space for luggage.